Sweatshirt with hood and pockets on the belly, featuring the Praha Drinking Team motive on the chest. This is exactly the sweatshirt you can buy in souvenir shops around Prague city center. This is a genuine local product with graphical design protected by copyright. The motive is printed locally by the vendor in Czechia on high quality Gildan textile made of 65% cotton and 35% polyester. Color selection: please refer to the product pictures above, displaying the available colors of black, dark blue, red, green and white. White color is being discontinued, so please do not order combination White M and White XXL - we cannot deliver it any longer. New colors of green and violet are introduced instead. Size selection: XS to XXL. Please refer to the Hoodies Size Table to determine the right sweatshirt size for you. Read the Czech Beer Story in our blog. Please refer to the Size Chart below when deciding about the right sweatshirt for you. 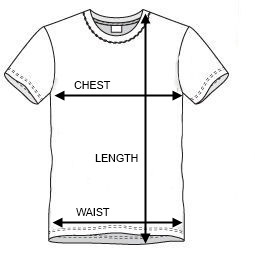 The chart shows real product dimensions (chest width, waist width and length) so that you can compare it to your existing apparel which already fits you best. Black-haired lady model Regina: height 170cm, bust girth 100 cm, waist girth 68 cm, hips girth 100 cm. Regina is wearing sweatshirts of size S.
Soft blonde lady model Andrea: height 169cm, bust girth 96cm, waist girth 81 cm, hips girth 100cm. Andrea is wearing sweatshirts of size XS.